Looks like little stained glass windows Undersides of leaves are royal purple Hardy Zones 4-9, Shade or morning sun Height: 7" Spread: 12" The plant you will receive is growing in a 3.5 inch pot. 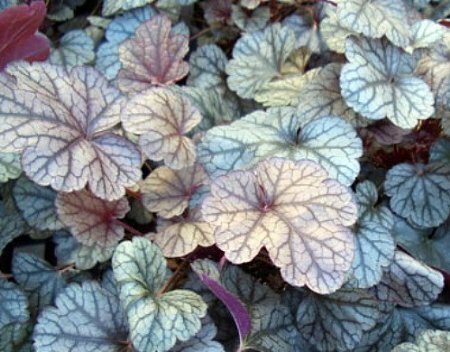 An enchanting looking heuchera, this selection displays leaves with such crisp color patterning that they look like little stained glass windows. They range in color from season to season in response to changing light levels. In spring, they are deep grape purple with a heavy steel-grey overlay and crisp veination. Their undersides are royal purple, revealed by the curling of the leaves. During the winter, the foliage turns to a rich violet hue. Though the extraordinary foliage is reason enough to grow this plant, it has the added bonus of producing rose-pink buds which open to greenish-cream flowers on 24 inch scapes in late spring.